The College Football Playoff institution started picking the nation’s biggest football matchups in CFP in 2014. By the start of the 2015 season, CFP knew that their procedures had to be facilitated by a secure and reliable software solution. After a blind vendor selection process, CFP entrusted Code Authority with building this solution. CFP undergoes a process that determines some of the biggest football games annually — the software had to be highly reliable and secure. With only two months before the start of the 2015 CFP season, the software solution had to be built and implemented quickly. Code Authority was thrilled to be selected as CFP’s software provider — even though it was a daunting task. Through arduous requirement gathering and testing, Code Authority attained great success in constructing CFP’s software. To this day, trained Code Authority employees are present during voting sessions in order to monitor for any system issues or irregularities. Code Authority provided a highly secure and fast software solution through rigorous testing. Code Authority extended unique support services to make sure voting sessions were free of issues and errors. 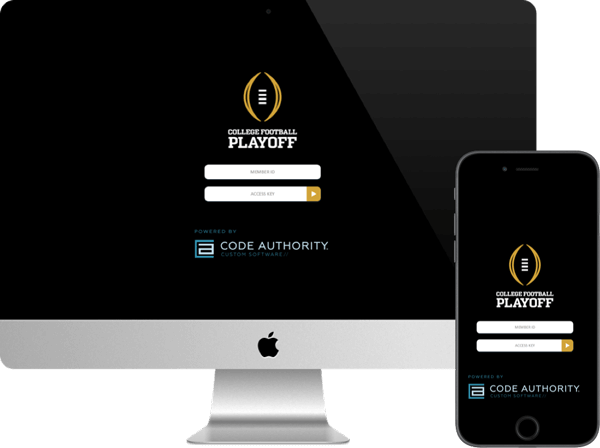 "The College Football Playoff selection process uses a specialized, ultra-modern solution built and maintained by Code Authority Custom Software to securely manage the entire Committee Meeting protocol. Code Authority does a great job for the College Football Playoff. It was not an easy project, but they did a great job!"